Bueno no ha sido todo Nueva York, han sido los autores del blog New York Food Journal, los que a lo largo de casi un año han ido ofreciendo a sus lectores un extraordinario conjunto de artículos sobre gastronomía vasca, incluyendo un par de recetas. Ademas de una entrevista con los Arzak dividida en tres entregas. Curiosamente las dos recetas se basan en los pimientos, una en los de Ezpeleta y la otra en los del Piquillo. Es decir Euskadi en toda su dimensión. Esta serie de artículos se tratan de toda una excepción (lógica por otra parte dado lo extraordinario de la cocina vasca), ya que su foco de trabajo está centrada en el que ellos definen como: Recetas, reseñas de restaurantes, diatribas y compras, en el área de la Ciudad de Nueva York. A nuestros lectores les dejamos las referencias de los cinco artículos y a ellos, como es nuestra costumbre, les invitamos a que vuelvan a visitar este pequeño rincón de Europa, donde en cada curva del camino encontrarán una gran y fantástica sorpresa culinaria o cultural. This is the second installment of our Beyond the Five Boroughs series on Northern Spain and the first of three on the Basque Country. The next post will cover pintxos in San Sebastian, and the third will be a review of the renowned Restaurante Arzak. The first post was on Barcelona. 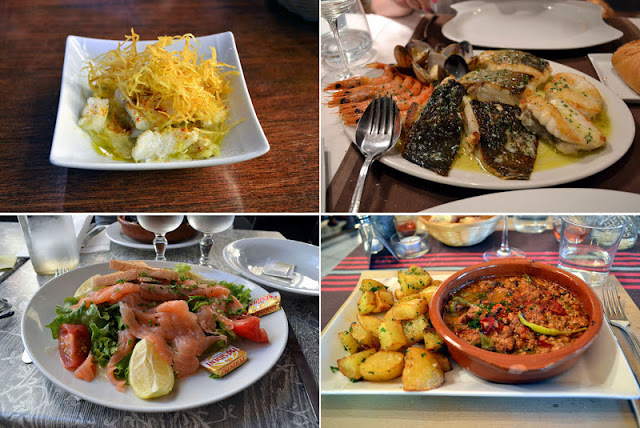 I knew I had fallen in love with the Basque Country when, a few hours off the plane from Barcelona, I found myself standing at a wooden table over a small but elaborately prepared pintxo featuring grilled shrimp. The shrimp were grilled to perfection and piled on top of juicy roasted tomato and a smooth white puree of cabracho, a funny-looking fish. The whole thing was sitting in a pink seafood broth with a drizzle of bright green herb oil and topped with trout caviar and vinaigrette foam. It was perfect. The shrimp had just the right texture and the cabracho had just enough body to stand up to the flavorful sauce. San Sebastian is essentially my version of paradise. There isn’t exactly anything to “do” there. Days are spent lounging on the long crescent-shaped beach and wading in the crystal clear water that is shielded from waves by a small island in the center of the inlet. Meal times are spent enjoying pintxos in the old town, traditional and modern alike, set out in overwhelming arrays of color and flavor. The key word here is txikiteo. Txikiteo (pronounced “chee-kee-TAY-oh”) is the art of hopping from bar to bar, stopping at each for a carefully selected pintxo and a drink. Txikiteo is both easier and harder than it sounds. It is easier because the old town is packed full of pintxos bars, often with multiple attractive locations on a single block (see map below), and everyone is joining in the fun. It is harder because choosing only a single pintxo at each stop, or even only a few, takes an awful lot of willpower. As part of our journey through the Basque Country, we had the pleasure of visiting the world renowned Restaurante Arzak, a three-Michelin starred restaurant in San Sebastian. Run by the legendary Juan Mari Arzak and his daughter Elena (pictured above), it consistently ranks as one of the best restaurants in the world. Arzak is at the forefront of la Nueva Cocina Vasca, the New Basque Cuisine that has influenced chefs all over the world, including back home in New York. This is the first installment of our three-part feature on the Arzaks and their restaurant. Fresh from our personal tour of the Arzaks’ kitchen, wine cellar, and test kitchen, we were feeling euphoric and hungry. Sous Chef Zalakain sat us down at a quiet table in the spacious main dining room and handed us over to the waitstaff. The dining room is sleek and modern, almost minimalist, with white tablecloths and simple flowers on top. Next to us was a happy-looking American couple on their honeymoon. Having just finished our meal at Arzak we were elated and, to be fair, a little bit drunk. Our waiter led us back into the lounge where we had been invited to have coffee with Juan Mari and Elena Arzak. He sat us down next to a silver tray of chocolates made into the shapes of keys, nuts, and bolts, and labeled with the words “Ferreteria Arzak” – Arzak’s workshop. Thinking back on my time in the French Basque Country, I was most inspired by the axoa, a traditional ground veal dish from the town of Espelette similar to a cross between sausage and peppers and texas-style beanless chili. 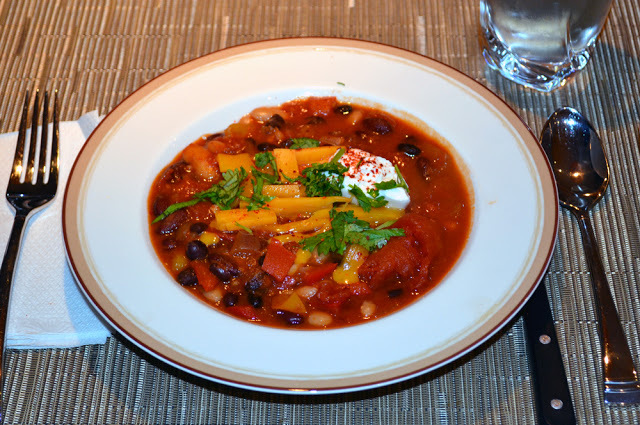 I wanted to make a vegetarian dish inspired by the axoa, so I chose a three-bean chili with bell peppers incorporating piments d’Espelette, the ground Espelette pepper that I purchased at its source. Whereas the jalapenos and serranos I usually employ in chili pack a strong lip-burning heat, Espelette pepper has a mild tongue-tingling heat that gives it a distinctive character. Our trip to San Sebastian inspired us to host a party featuring pintxos, the Basque Country’s iconic small plate creations speared through with toothpicks. Pintxos (“PEEN-chohs”) are the perfect party food: colorful, tasty finger foods that pack all their flavor into a couple of bites. We turned to piquillo peppers, a mildly sweet pepper that is served all over Spain and is easily available in the United States. Piquillos are similar in flavor to the sweet red peppers you might find on a good deli sandwich. They are relatively small and have a hollow conical shape that makes them perfect for stuffing. 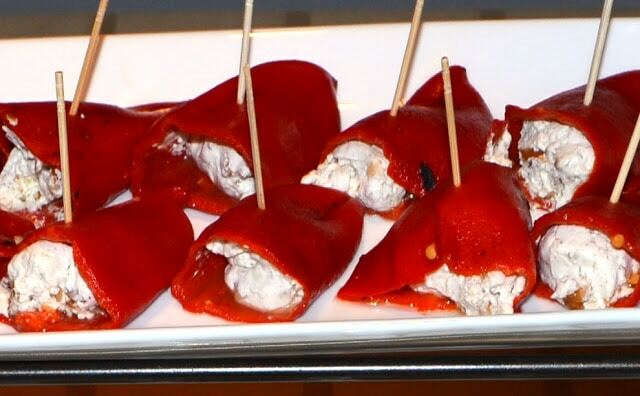 In San Sebastian, they stuffed them with salt cod brandade and baked them in a creamy pink tomato sauce. Artículo anteriorSe comercializa el kalimotxo a la francesa: se llama ¡Rojo Pirulí Cola!